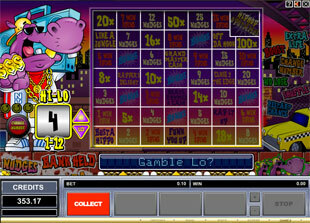 HipHopopotamus Slots is a 3 reel 1 payline video game created by Microgaming. 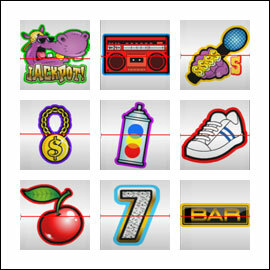 This slot can be a finding for you if you are a fan of hip-hop. Playing this classic slot you can win the top jackpot of 500 coins. This game provides you with a lot of bonus options that make your entertainment more absorbing and exciting. For example, you can choose Hold and Nudge feature during spins as well as enjoy interesting bonus game with a lot of options to choose from. This slot can be played in no download version. In other words, you don’t need to install special software on your computer and you can enjoy this game anywhere you have Internet connection. Enjoy cool and funny HipHopopotamus slot that presents you such colourful icons as Cherry, Seven, Bars, Shoes, Microphone, Tape Recorder, Spray Can, Bling Necklace and of course, funny HipHopopotamus. Collecting three of these bright icons guarantee you attractive prizes. You can choose among such coin sizes as $0.10, $0.2, $0.25, $0.5, $1, $2, $5, $10.00. You can play with 1 coin per line only, so the minimum bet of this game is $0.10 while the maximum bet is $10.00. 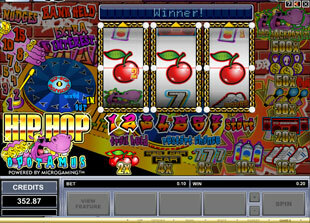 The highest jackpot is 500 coins or $5,000 for 3 HipHopopotamus. The second jackpot is 50 coins or $500 for 3 Bling Necklace. The third highest jackpot is 30 coins or $300 for 3 Microphone. Bonus Game. There are quite a lot of extra features including Nudge and Hold buttons that appear during spins. All you need to do to activate Bonus Game is to follow the instructions you can see above the reels and choose the right numbers and options. As soon as you activate bonus feature a table with prizes to win will be displayed. You should choose Hi or Lo trying to guess whether the next number will be higher or lower than presented. During this feature you can win Free Spins and multipliers. You also can collect your prizes any time before the choice is made. HipHopopotamus slot machine is an amazing game that provides you with absorbing bonus feature during which you can have a good time as well as win attractive prizes. Playing this simple game you can win up to 500 coins or $5,000.